I was wondering who has the authority to put on a state funeral for the deceased. Is there a committee board or just some random guy in the government? Im very surprised that Ong Teng Cheong did not get one but some deputy minister get it? If you follow like a slave, till death we will remember you. I believe there only one member in this State Funeral Criteria Selection Committee and we all know who he is. Go do some research on Ong Teng Cheong and you will know why he didn't get a state funeral. And also why have an idea why we have such a staid, bland president right now. Great job to have though. I refer to media reports that the honour of state funerals was accorded in the past to former presidents Yusof Ishak and Benjamin Sheares. I would like to ask whether a state funeral was accorded to the late former President Ong Teng Cheong when he died in 2002. If not, why is it that he is the only president who was not given a state funeral? As Singapore’s first elected president, I think many Singaporeans may feel that he deserved a state funeral. The late President Ong Teng Cheong dedicated 27 years of his working life to public service, as President for six years, Deputy Prime Minister for three years, Second Deputy Prime Minister for five years, Secretary-General of NTUC for 11 years, chairman of the People’s Action Party for 12 years, Minister for Communications, and Member of Parliament for 21 years. Who decides whether a former president is to be given a state funeral? Is there some criteria for deciding on a state funeral? I suggest that a state funeral be accorded to all former presidents who die in the future. Letter from Leong Sze Hian. 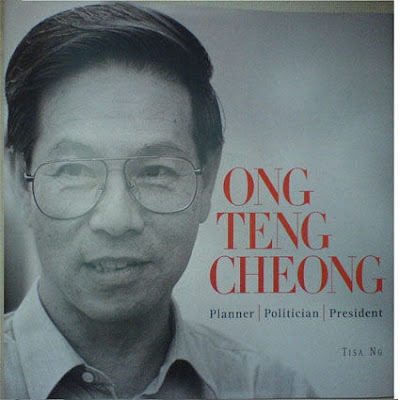 President Ong Teng Cheong’s political career spanned 21 years. He was Member of Parliament, Cabinet Minister and Deputy Prime Minister, before he resigned to become Elected President in 1993. And it was as Communications Minister that Ong pushed for the development of the MRT system, the largest construction project in Singapore’s history. His next challenge came on the labour front, when he became NTUC Secretary-General in 1983. Ong was diagnosed with lymphoma-cancer of the lymphatic system in 1992. But this did not dampen his desire to continue serving. He became Singapore’s first Elected President a year later, and it was a presidency marked by many charitable projects, which touched the lives of many Singaporeans. Ong stepped down as President at the age of 63. As chairman of the People’s Action Party (PAP) and secretary-general of the National Trades Union Congress, Ong was considered a firm Lee Kuan Yew loyalist. In January 1986, he sanctioned a strike in the shipping industry, the first for about a decade in Singapore, without telling the cabinet. He said that he did not inform the cabinet or the government because they would probably stop him from going ahead with the strike. There was a major corporate and Cabinet backlash against his decision; however, the strike lasted only two days, and a deal was struck. He was also a former Minister of National Development. OTC family declined a state funeral. Both OTC and GKS served the same emperor. You are either for or against him. GKS left the political scene in 1984 and never got involved while OTC tried to gain access to the royal treasury, thus upsetting the emperor. One thing for sure, there will be a state funeral for the emperor. Let's hope it includes all familee members to make things cheaper for tax payers. Its a pity that OTC did not get a state funeral. Somebody should publish the reasons behind to the singapore media so as to let everyone knows. The late Mr Ong had already requested not to have a State Funeral.